In an effort to promote downtown bicycle tourism and improve safety, the city of Lodi is planning a road diet on one of its main streets. The project is located on Church Street on a half-mile stretch between Lodi Avenue and Lockeford Street. The road diet will reduce four lanes to three, install a center left-turn lane, and add bicycle lanes and pedestrian safety enhancements. The project will cost an estimated $1.5 million, most of it coming from the San Joaquin Council of Government’s Measure K Bicycle, Pedestrian, and Safe Routes to School Program and the Smart Growth Incentive Program. The city will fund the remainder, about $60,000. There is a similar three-lane configuration already on Hutching Street, three streets over from the proposed project site, so “it’s not a new idea to Lodi drivers,” Vohras noted. Vohras said the simulations show that, even though there are no major traffic capacity issues under current conditions, a road diet will slightly improve total travel time and fuel consumption by creating a center turn lane. Lodi, located in San Joaquin County about forty miles south of Sacramento, has billed itself as the “Zinfandel Capital of the World,” and become a destination for wine enthusiasts as well as wine-country-biking enthusiasts. “The winery tourism has really taken off here,” according to Kathryn Siddle, president of Bike Lodi. She added that the flat terrain makes it a good place to bike. Bike Lodi has partnered often with the Visit Lodi! Conference & Visitors Bureauon bicycle tours and guides to wineries. There are about twenty routes in the city and surrounding countryside, but as tourism has grown, “it became apparent that our infrastructure was lacking in some ways,” Siddle told Streetsblog. 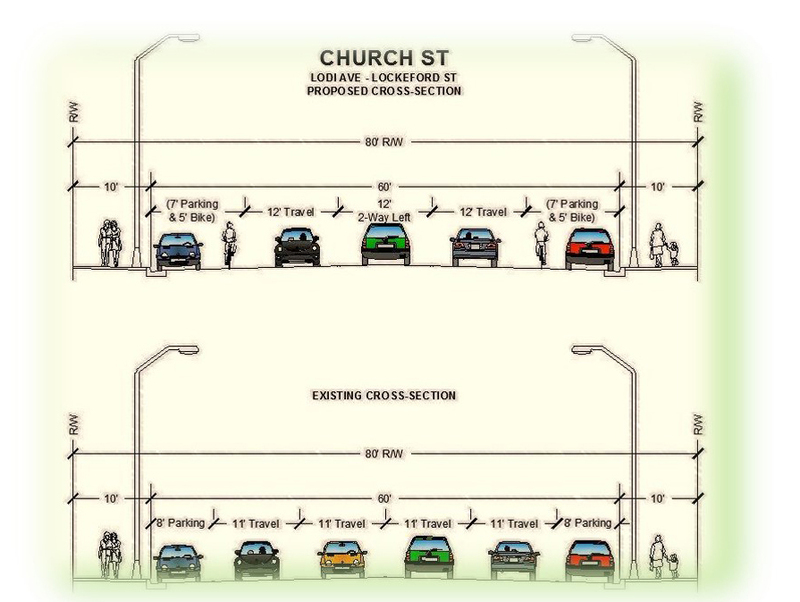 The Church Street bike lanes will connect to existing bicycle lanes, creating a north-south route through town, something Bike Lodi has been championing. There is currently a route going east from the Amtrak Depot into downtown, where most of Lodi’s traffic is concentrated. The last piece missing from a more complete network is a bike lane going west. “I’m not asking for every street to have a bike lane–although that would be great. Just so that we can get across town,” Siddle said. Siddle added that she has noticed parking downtown has become scarcer, and drivers can spend a good deal of time looking for parking. To make riding a bicycle more appealing, Bike Lodi has raised money to install bike racks throughout downtown. “The businesses like it,” Siddle said. Patrick agrees that businesses will benefit from the road diet. “In the Chamber’s opinion, downtown businesses have nothing to be worried about and should support this Church Street road diet project. We are also looking forward to seeing more cyclists visit the downtown corridor,” he wrote. Vohra said one of the goals for the city is definitely to improve economic development, but its main driver for the Church Street road diet was safety. Between 2013 and 2017, there were 102 reported collisions at seven intersections along Church Street, resulting in 57 people getting injured. Five of those injuries involved bicycles, and another five involved pedestrians. Originally posted at Streets Blog Cal.